Responding to escalating citizen protests, Sudan's military ousted President Omar al-Bashir on Thursday, ending his 30 years in power. Citizens are demanding political change. They do not want anyone from al-Bashir's regime to take his place. They are refusing to back down to the military’s emergency clampdown. Tens of thousands of protesters amassed Thursday at a sit-in outside the military’s General Command headquarters. Protest organizers vow to rally until there is a new civilian transitional government. Al-Bashir’s presidency began from a coup of his own in 1989. Backed by the military and Islamist hard-liners, al-Bashir’s leadership was brutal and contentious. His ruthlesscrackdown on insurgents (rebels) in the western Darfur region is infamous. He is wanted by the International Criminal Court for war crimes. His support of Islamic militant groups made his government a target for sanctions and air strikes by the United States. Thursday brought the end to his tumultuous presidency. Word of al-Bashir’s removal was first announced on state TV. 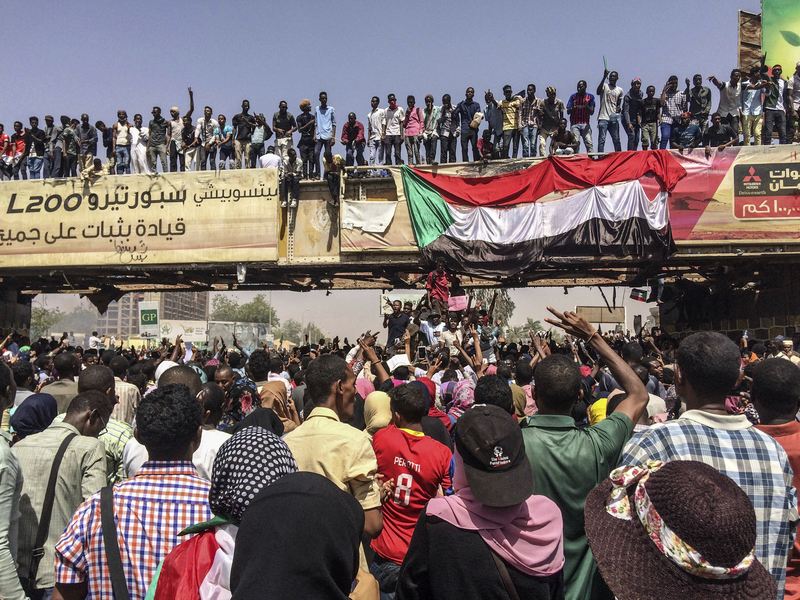 Hearing the news, thousands of protesters marched in the capital Khartoum, cheering, singing, and dancing in celebration. Hours later, Defense Minister Awad Mohammed Ibn Ouf announced that the military had arrested al-Bashir. His exact whereabouts are uncertain. “I the defense minister, the head of the Supreme Security Committee, announce the uprooting of this regime, seizing its head, after detaining him in a safe place,” he said. Ibn Ouf apologized for the killing and violence that took place under al-Bashir’s rule. The defense minister said a military council will rule Sudan for the next two years. Then, “free and fair elections” will take place. Effective immediately, the constitution has been suspended. The government is dissolved, a three-month state of emergency declared, the country’s borders and airspace closed, and a night curfew has been imposed. Political prisoners have been freed. Protest organizers are fearful of the military’s control. Resolved, they vow to stay on the streets in spite of the curfew. “We are not leaving,” the Sudanese Professionals Association says. This is a volatile situation, with no clear strategy for the exchange of power. The military coup removed a corrupt president. Citizen protests demand democracy, but will the military allow it? Time will tell. Nations come and nations go. But our God reigns forever. totally agree with you Nadia A.
Thirty years is a really long time! I'm glad he has lost power, but two years seems like a really long time to wait for elections. If I lived in Sudan I would be worried. I agree with NA and BG! @ all that agreed with me. I agree with all of you!! Wow! That's crazy! 30 years!